So, it was time to experiment! I’ve used a standard vegetable stock as the base, flavoured with a little caraway, and sage, basil and mint for the herbs. For the vegetables I’ve used tomato, radish, courgette and chilli, which was a great combination, and very pretty too! Little cubes of silken tofu add protein as well as texture, and a squeeze of lemon completes the dish. It was really good, ever so satisfying and a new combination of flavours for my noodle soups. A sort of euro pho if you will! Bring the stock to the boil and add the caraway and courgette. Simmer for 3 minutes until the courgette is starting to soften. Add the noodles, chilli and sage and simmer for a further 2 minutes. Next, the radishes, tomatoes and tofu. Cook for a further minute, you just want to warm them through. Carefully stir in the herbs (so as not to break the tofu up), and season with lemon juice and black pepper. 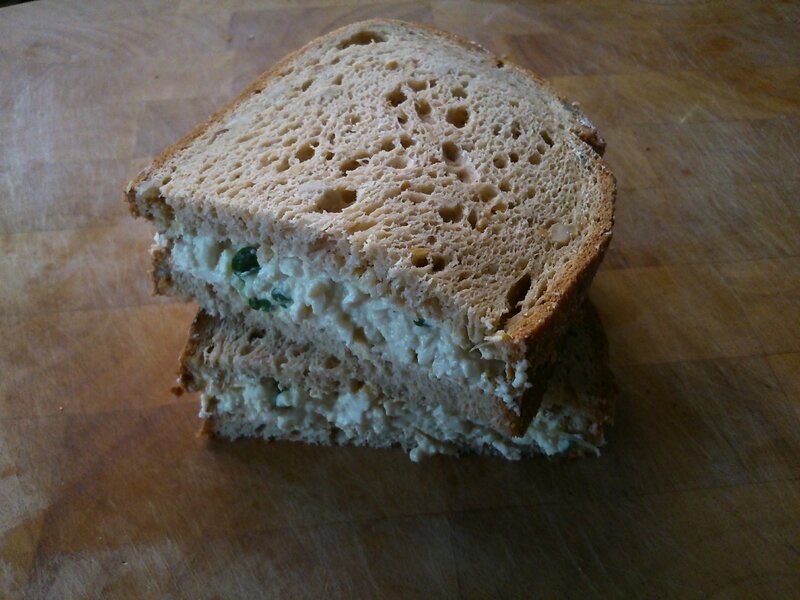 I made tofu ‘egg’ mayo a couple of times a while ago (when I ate vegetarian rather than plant based), using the recipe from the mori-nu website, and although it’s very tasty and surprisingly egg like, it contains honey. I tried it once without the honey and it didn’t work at all! So it was time to come up with my own recipe. I was very taken with the soy flour mayo I made for this recipe, so that became my base. And along with black salt for ‘egginess’, and cress because you can’t have egg mayo without it, it made an astonishingly close replication! It’s silly really, when I ate eggs I really wasn’t fond of egg mayo, but this version has a much nicer texture and mouthfeel as well as being so tasty and very moreish. Just a note about the black salt. It loses its flavour over time, so if you’re making the sandwich filling in advance, mix the black salt through just before making the sandwiches. It’s fine overnight though. Oh, and the bread in the photo is a Bfree loaf. Vegan, gluten free and perfect for sandwiches! Whizz together all of the mayo ingredients in a mini blender until well combined and thickened. I use the attachment from my immersion blender. Put the tofu and mayo in a bowl and mix, breaking the tofu up into chunks. It’s nicest if it has a bit of texture. Stir the cress through.